Wow! This is a FANTASTIC idea for all kinds of parties and decorations....indoor OR outdoor! 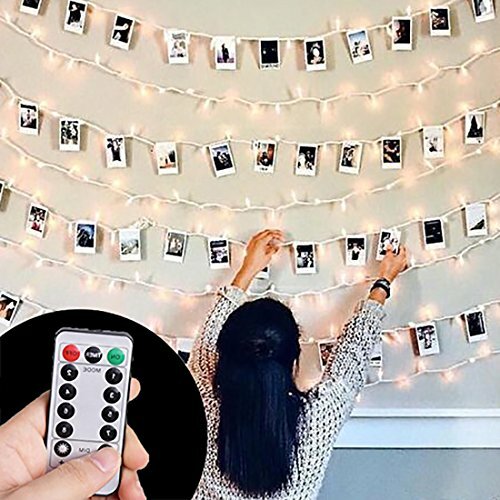 ✡ It is not just a showcase of pictures or artworks, but also a perfect tool to recall one's unforgettable and wonderful memory with HAYATA 40 LED Wooden Photo Clip String Lights. ✡ They are ideal for hanging photos, holiday cards, children's artwork, or whatever lightweight crafty/decorative items you desire. 1. turn on the lights by power button or with remote. 2. Point the remote directly to the battery case, click timer. 3. When you see the lights twinkle, then it is set. You will need to set the timer again of you shut off the lights manually. ✡ BATTERY OPERATED - Requires 3 x AA Batteries (Not Included), so it is portable and can be mounted anywhere for ambience decoration and atmosphere creating and won't fail easily with continuous lighting. ✡ 8 MODES WITH TIMER FEATURE - There are 8 options of lighting modes and 10 levels of brightness can be chose; The timer will keep 6 hours on 18 hours off automatically once activated. ✡ HANDY REMOTE - with a remote in hand, you can easily turn on/off the lights; set them in timer to auto on and off each day; adjust the brightness; switch from flash to twinkle to slow fade to steady on etc. ; ALL IS IN YOUR CONTROL! ✡ WATERPROOF - Rubber ring protects the control box, the entire string lights is waterproof. Can be used for both outdoor and indoor, such as patio, garden, bedroom, deck, pergola, etc. If you have any questions about this product by HAYATA, contact us by completing and submitting the form below. If you are looking for a specif part number, please include it with your message.